An accomplished and amusing speaker Mrs. Ramsay can speak on many interesting topics, see below for a list of previous speeches. As a child development specialist she can speak on child education to mothers and/or teachers. Having travelled extensively, 37 countries, she can speak knowledgably on many cultural aspects. Being married to a Japanese man and having served for 5 years on the Board of The association of Foreign Wives of Japanese, gives her tremendous insight into the East Vs West syndrome. If you have other ideas for speeches Ask. She has delivered speeches on a wide range of subject. 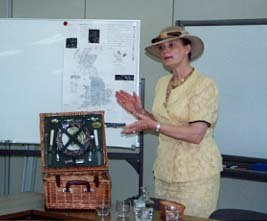 In the above picture she is giving a speech on "Aftrnoon Tea".